Do you have a favourite preacher or Christian author? If I were to compile a list of all the greatest preachers of all time, high on that list I would have to place A.W. 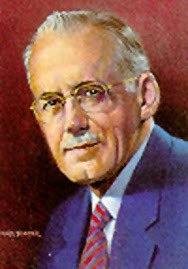 Tozer (1897-1963). It has been said that, “No one could say it like Tozer.” I would have to agree. The miracle of the new birth was foreshadowed in the Old Testament. “Create in me a clean heart, O God; and renew a right spirit within me.” There was at least a hint of a miracle within the human breast. Not the reasoning of yourself into a position, but something happened that could not be explained. … Just as soon as psychologists can explain what happens to a Christian believer, that believer has been unfrocked! The New Testament draws a sharp line between those who had become Christians by any other method, and those who experienced regenesis. In that great and terrible day, there will be those white with shock when they find that they have depended upon a mental assent to Christianity instead of upon the miracle of the new birth! "You must be born again (John 3:7)," said Jesus. Have you been "born again," or are you simply depending upon, as Tozer calls it, "a mental assent to Christianity," which really is no Christianity at all? "A mental assent to Christianity"? Hmm, how many people have "become" Christians because there was nothing (or little) to loose by doing so. Many people call themselves Christians (a "mental assent") but who have not actually been "born again." Could it be to such "Christians" that Jesus was referring to when He said, "I don't know you" (Matthew 25:12)? Hmm, I wonder.